Here at deBebians, we have many signet rings for sale. Whether you are interested in a female signet ring, a male signet ring, a pinky signet ring, a family signet ring, or a custom made signet ring… we’ve got you covered. With signet rings for sale in a variety of shapes, weights and prices, you are bound to find the signet ring you have been seeking. Measuring at 11 x 10.6mm, I would consider this a female signet ring. I love this recently purchased ring because it has a solid back and weighs just under 4 grams. This client chose to have her three initials monogrammed via hand engraving in an interlocking monogram style. This is a classic signet ring she will enjoy for years to come! 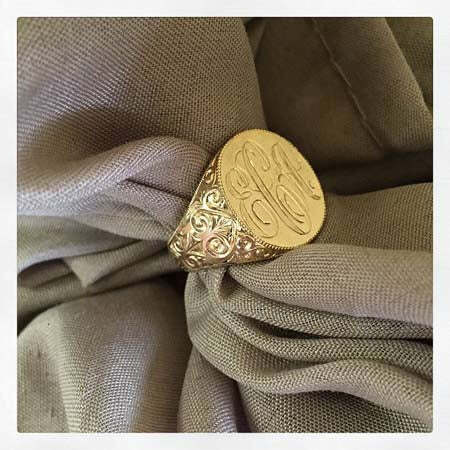 Check out this custom made signet ring! Here we took style SRRS126 and not only hand engraved the customers initials on top, but we also added a beautiful hand engraved scroll design with milgrain framing the top area of the signet ring. What a masterpiece! Our client was over the moon with his brand new custom made signet ring! Probably my favorite custom made signet ring is this gorgeous rose gold signet ring with hand engraved interlocking initials sitting inside a frame of pave set round brilliant cut diamonds. We have done this particular diamond signet ring with and without engraved initials and it always looks phenomenal. 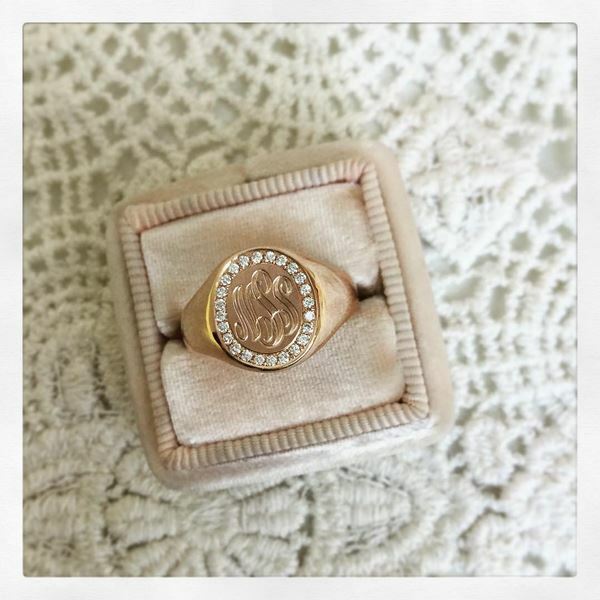 I absolutely love the idea of adding diamonds to your custom made signet ring! 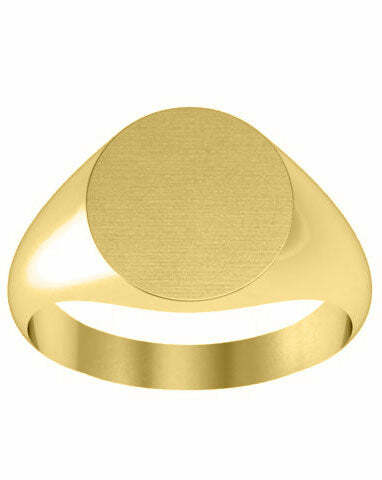 Be sure to check our large selection of signet rings for sale. We have so many choices available and can even take things a step further by customizing any of our signet rings. If you do not see what you are looking for, be sure to contact us! Happy shopping!